HTC’s One M10 will be unveiled on April 12. 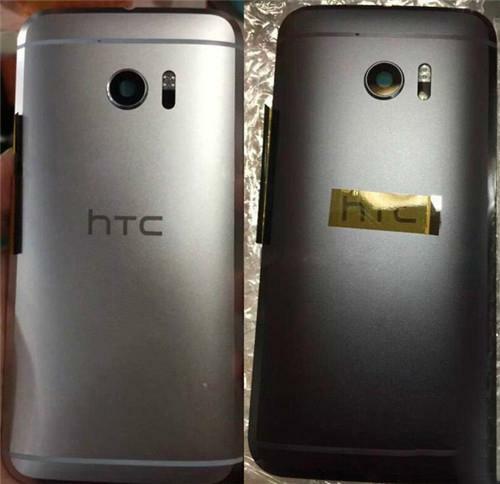 So far, rumors and leaks have pointed to a hybrid device with a right mix of design elements from the predecessor HTC One M9 and the upper-mid-range HTC One A9. In the run up to the scheduled launch, the Taiwanese tech giant has been very active in uploading teaser-after-teaser via all social media outlets. The company promises to showcase a device like never before with a phenomenal camera unit. Now, a new leak showing HTC One M10, also known as HTC 10, with a Metallic Black exterior placed right next to the Silver variant is making rounds online. Moving on to rumored HTC One M10 specifications, this handset will apparently carry a 5.1-inch AMOLED display, packed with QHD screen resolution. Under the hood, Qualcomm’s Snapdragon 820 chipset will power the smartphone with 4 GB of RAM backing it. Past reports suggested that HTC is also working on a Snapdragon 652-powered variant of the M10, which will be released in certain markets and it is expected to cost less. When it comes to internal memory configuration, the One M10 is believed to come equipped with 32 GB of native storage space. In addition, a microSD card slot will help in expanding the memory capacity as needed. Furthermore, the HTC One M10 will sport a 12-megapixel rear-facing camera unit, in addition to a 5-megapixel front-facing snapper for selfies and video chats. Android 6.0.1 Marshmallow OS will run the M10 with HTC’s Sense 8 UI on top of it. This handset will apparently house a 3,000 mAh battery unit to keep the lights on. Teaser showed a fingerprint sensor embedded in the home button. As far as the price goes, the HTC 10 will reportedly cost 740 euros (i.e. about $853).